Three people have appeared in court charged with membership of the banned neo-Nazi group National Action. Garry Jack, 22, and Daniel Ward, 28, both of Birmingham, and a 17-year-old boy from Nottingham are accused of being in the group after it was outlawed under anti-terror laws. The three appeared at Westminster Magistrates' Court on Tuesday. 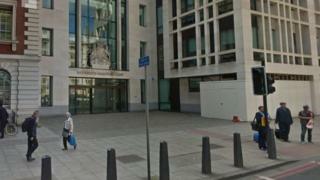 They did not enter a plea over the terrorism offences and will next appear at the Old Bailey on 12 October. The 17-year-old, who can not be named for legal reasons, was granted bail, while Mr Jack, of Heathland Avenue, and Mr Ward, of Highmore Drive, were remanded in custody. The charge alleges they belonged to National Action between December 2016 and September 2017. A couple who were charged last week with the same offence will appear alongside them at the Old Bailey. Mark Jones, 24, and Alice Cutter, 22, both of Wharf Street in Halifax, appeared at Westminster Magistrates' Court on Friday. All five were arrested on Wednesday by the West Midlands Counter Terrorism Unit.